In 2008 the Ranch began to shift more of its focus to food production. Since then we’ve added hens, hundreds of fruit trees, thousands of nitrogen-fixing trees, hundreds of additional square feet of garden space, a thriving nursery, many linear feet of earthworks, and various water and nutrient cycling systems. Many of these improvements have been designed and implemented using permaculture practices with the goal of meeting human needs using techniques that harmonize with ecological patterns. Permaculture is sustainable land use design. As a design science it is based on ecological and biological principles, often using patterns that occur in nature to maximize efficiency and minimize work. Permaculture aims to create stable, productive systems that provide for human needs, harmoniously integrating the land with its inhabitants. The ecological processes of plants, animals, their nutrient cycles, climatic factors and weather cycles are all part of the picture. Inhabitants’ needs are provided for using proven technologies for food, energy, shelter and infrastructure. Elements in a system are viewed in relationship to other elements, where the outputs of one element become the inputs of another. Within a Permaculture system, work is minimized, “wastes” become resources, productivity and yields of all kinds increase, and environments are restored. Permaculture principles can be applied to any environment, at any scale from dense urban settlements to individual homes, from farms to entire regions. The method was scientifically developed by Australians Bill Mollison and David Holmgren and their associates during the 1970s in a series of publications. The word Permaculture is described by Mollison as a portmanteau of permanent agriculture. This later came to be permanent-culture. The Permaculture Design Certification course or PDC was developed as an intensive multi-week training to disseminate Mollison's knowledge and ideas. The intent is that, by training individuals in a core set of universal design principles, those individuals can design their own environments and build increasingly self-sufficient human settlements. Ones that reduce society's reliance on industrial systems of production and distribution, which Mollison identified as fundamentally and systematically destroying Earth's ecosystems. 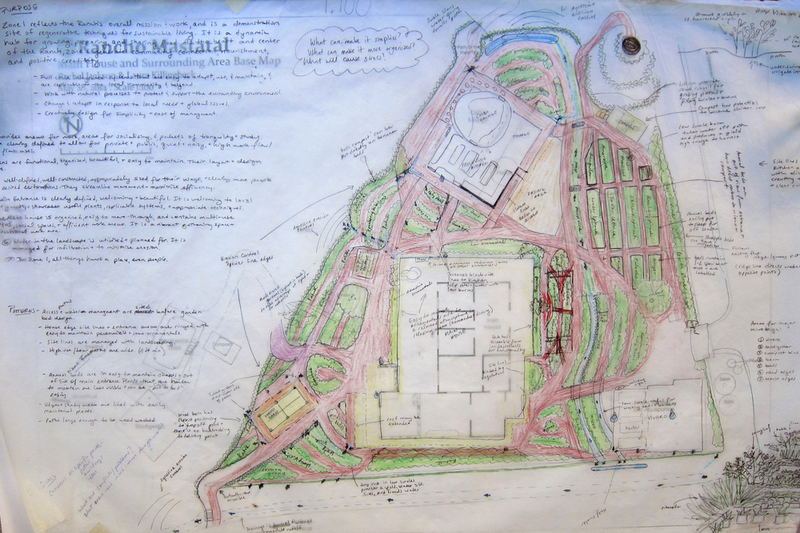 Rancho Mastatal offered its first Permaculture Design Course in July of 2010. It was a great success that we've replicated each year since. To keep abreast of our Permaculture offerings, please see our workshop page. Farm manager and permaculture instructor, Scott Gallant has been featured on the Permaculture Voices podcast and writes for Permaculture News. The following series of articles highlight the details of our agroforestry systems. They were produced as part of a three part series on tropical orchard establishment techniques and concepts. Part 1: Our goals, layout strategies and water management. Part 2: Our approach for building soil fertility. Part 3: Species selection choices for our site. Today we work with a large network of practitioners, farms, nurseries, and homesteaders around Costa Rica to source materials, create markets, share ideas, and build community. Many of those projects have been compiled in through the Costa Rica Farm Network google map. Ranch Farm Manager, Scott Gallant, is the founder of Porvenir Design, a landscape design firm specializing in whole site master planning for farms, communities, hotels, and homesteads. For more information about these services, please go to the Porvenir Design website.